A woman in Oregon is fighting for sole custody of her sons after finding out that her ex husband had reunited with his first wife, who had shot and killed the couple's two daughters in their sleep in 1991. If it sounds confusing and horrible, that's because it is. The New York Times reports that in 1991, Kristine Conlon murdered her daughters, age 4 and 8, while they slept in their beds in Orange County, California, but later successfully pled not guilty to the crime by reason of insanity. She claims she was driven temporarily insane by Prozac. After serving four years in a California mental institution, Kristine was released and monitored until 2005, when she was officially deemed to not pose a risk to society. Mr. Cushing remarried his first wife in 2005. Ms. Conlon suspected that Ms. Cushing might be back in Mr. Cushing's life, but said she did not learn it for certain until two years later, when she received a call from a Washington State Child Protective Services worker. The worker told her that the agency had just received a call from Ms. Cushing's therapist, who reported that she was living with children again. Ms. Conlon threatened then to go to court to seek a change in the boys' parenting plan, court records show. Instead, Mr. Cushing told her not to worry about it; Ms. Cushing had decided to divorce him and move out. But the divorce was never finalized. Ms. Cushing moved back in. According to a court declaration by Mr. Cushing, that was in March 2008. For the next three years, Ms. Conlon said, she had no idea her boys were spending time with Ms. Cushing. Mr. Cushing deliberately concealed that fact, she claimed, by instructing the boys to refer to their stepmother by a different name - "Mrs. M."
Conlon discovered that Mrs. M was actually Kristine Cushing when she picked her sons up and saw a recent painting of the woman hanging on her ex husband's living room wall. Ms. Conlon's sons had been spending time around a woman who had admitted to killing her two children. Understandably, she was upset by this and moved to change her and her ex husband's custody agreement. The courts ruled against her. She's appealing the ruling, but in the meantime, must adhere to the previously agreed upon custody plan. 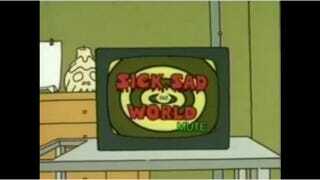 Be sure to tune in next time for Sick, Sad World.